Opening week report from Kharlovka and Litza June 2012. The adventure was a last minute thought for me, this year I was preparing for a second knee replacement, which should have happened in May, but I decided against the operation and because of a last minute cancellation, I found myself talking to Justin McCarthy about taking the last place on the opening week. Preparations including visa,s and flights were quickly processed and I soon found myself on the way to Helsinki. There I met up with old faces including an old buddy David Thompson and we decided that we would team up to fish together for the forthcoming week. We were greeted at Murmansk by Justin who said conditions for the opening week looked perfect. We were taken by helicopter to Kharlovka camp and relationships with old friends renewed. The mood in the camp was one of great excitement, the river level was 30cm, which was over one metre lower than last years 150cm above normal, but more exciting was the 8.5 degree water temperature, both perfect. A quick lunch followed, and we all decided that with these conditions the chances of fresh fish throughout the system right up to the falls on both rivers was a definite possibility, for an opening week for me this had never happened before with fishing normally confined to the lower river. After lunch were then transferred to our beats by the camps new eurocopter, a four seater helicopter, a magnificent piece of kit, and although only four seats instead of the old helicopter that carried up to seven people, the distribution of fishermen along both Kharlovka and Litza systems was much quicker, with much more comfort and with an almost 360 degree vision, this is a great addition to the adventure. David and I along with Vasiliy our guide were dropped off on the lower Litza, and we set up to start our fishing on the left bank of Snowbank. A Reaction 14ft 8in 10/11 rod, Quadra 8/10 reel coupled with a float/int/sink2 triple density line and a TSL running line armed with my favourite willie gunn templedog fly was my preferred set up. 350 metres of new micro thin braided backing line completed the set up, how much different to last years fast sinkers. I connected with a fish within the first few minutes, but alas the hook didn’t hold. Kelts are normally quite prolific in the first week, and i wasn’t certain what had taken my fly, but at least something had happened. The anticipation of fishing these Northern rivers is intense, not knowing what the next pull will produce keeps the adrenalin on maximal levels. David and I covered all the lies on the left bank without success and Vasiliy suggested that we try the lies on the right bank. A few doubts were creeping into our thoughts, although all the pointers were leading us to believe that everything should be perfect, perhaps the fish were still not here in any numbers. I decided to fish the tail of Snowbank pool, and waded out to rocks in the middle of the river, which on normal opening weeks is not possible. After only a few casts the line drew tight and I felt the satisfying pull of a heavy fish, after twenty minutes of powerful runs a 22lb male fresh fish was in the net, a great start. We had only a few hours fishing that night but on our return to camp similar stories were being told, it was now obvious fish were indeed throughout the system. We looked forward to our first full day with great anticipation. 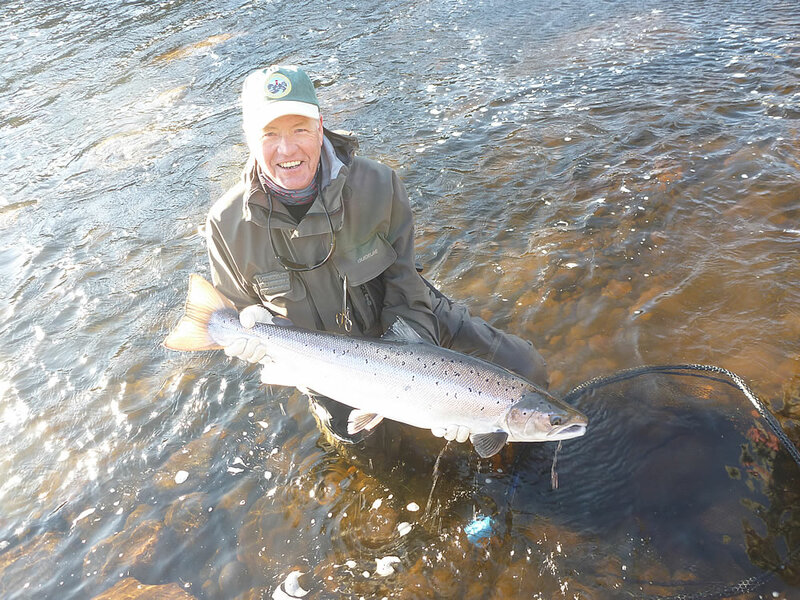 The first full day proved a great success, despite bright sunshine and very strong winds, David and I managed 6 fish from Kharlovka falls pool with 3 fish over 20lbs, all silver fresh and sealiced. Arriving back at camp, stories were related and the first day had been a great success, fresh fish up to 28lbs had been caught and we were all on a high. 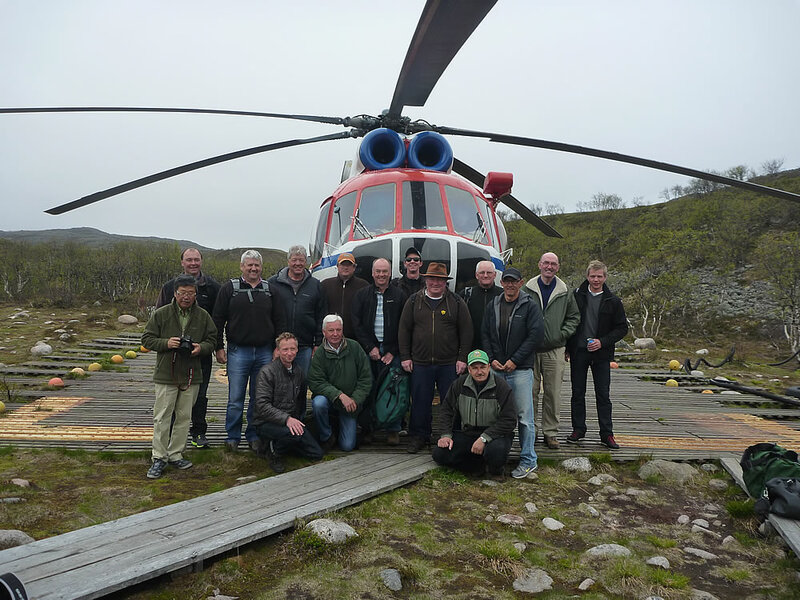 Our second day found us on Lower Kharlovka, the helicopter dropped us on the island which was under water last year. David fished the left bank and me the right bank, for our efforts we were rewarded with one small kelt. We then waded across the river and fished a super pool called Julians from the left bank. This pool is the first stopping place for any fish coming in from the sea about 1 kilometre away. We spent a couple of hours in Julians and for our efforts, and despite seeing one big fresh fish in the pool, we landed one kelt. We moved up river to fish Rocks pool, were I got my biggest fish last year and David got a nice 12lb fish. After lunch we continued up and crossed the river and fished Barrell pool without success. We had decided we would now fish down river on the right bank back down to finish in Julians. Nothing happened all the way down to Julians, and we arrived there at about 6pm. This pool at this level is best fished from the other side, so a deep wade and long cast was a necessity, so up to my armpits I went and with David below me we moved down the pool. Unfortunately David had lost his shooting head in the river and Vasiliy was wading in the river to try to retrieve it. He called to me and said the pool from this side was not good and he felt we were wasting our time, as he finished his sentence my line drew tight and I tightened into a powerful fish, and after a 15 minute fight we landed a 19lb long tailed sea liced fish. After a few photos I waded back into the pool and soon my line drew tight again, another powerful fish pulled the rod over. After a few minutes we knew this was a good fish and I said that this was the first time that my backing had been outside the rod, not long after I said to Vasiliy that I was happy that I had loaded my reels with 350 metres of new backing as this fish was now out of the pool and going down the left hand side of the island back to sea. We estimated at least 150 metres of backing had gone out, plus the running line and shooting head. Fortunately the fish turned and back it came. At one stage I was back onto the running line, but the fish went off again. In the fast current, most of the time the fish was in control. But as time went on I felt that I was winning the battle. After 45 minutes of battling this creature Vasiliy netted the fish. 34lbs of pure silver, long tailed sea lice, 112mm long 61mm girth . We all celebrated, it was my biggest fish from Kharlovka/Litza , to say I was happy was a gross understatement, I was over the moon. 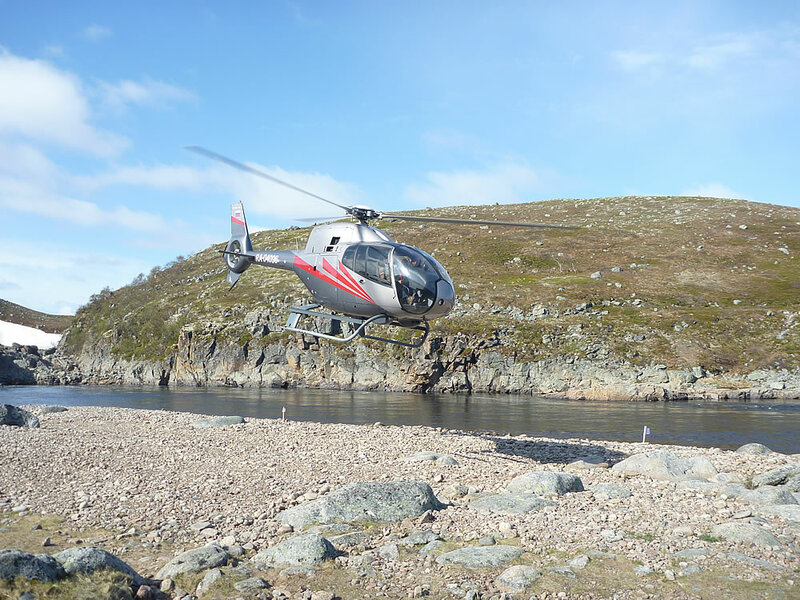 The helicopter picked us up shortly afterwards and I remember thinking on the way back down to Julians that although fishing is good it is certainly not easy, you have to work hard for your fish, but what a result. I spent the rest of the evening back at camp on cloud nine, along with more than a few vodka,s. Again other rods had got a few good fish including a 31lb fish from East Litza. Our next day we were on upper Litza, a beat which includes both the Falls pool and the big fish pool, Flat Stone, both great pools, but Vasiliy our guide suggested we start at Dream pool, he felt the small falls barrier at the top of upper Dream would hold the fish back.So we were dropped off right beside the river on Lower Dream. After our usual discussion about who fishes were, we decided that David would fish upper and me lower. I fished the pool through with no success, but David had a 22lb fish, we then had a coffee and carried on fishing as before. A 16lb fish for me and one of the same size for David followed. We then swopped pools and carried on with no more success. I then crossed the river to the right bank with Vasiliy in the rubber boat, and started to cast into the tail of the pool. With only a metre of running line out of the rod and just as I felt the line tighten, Vasiliy said yes !!!! he had seen the line pull tight. For about 10 minutes the fish just moved ponderously but powerfully on the short line, before making two good runs right across the pool, before coming back to its lie. What happened next was amazing, the fish tore off through the tail of the pool and down the rapids, stopping about 80 metres away alongside a big stone on my side of the river. A vertical cliff right behind the big stone would stop us following the fish down the river any further. We made the decision to climb down to the big stone and try to land the fish there but as I lifted the line over the stone and tightened, the fish turned and again continued its run down the rapids. Unable to follow the fish any further we now had to go back to the boat and with the fish still going down the rapids and us going the opposite way our chances of now getting this fish was fast diminishing. As we crossed the river in the boat I held my rod as high as possible and David who was watching from the left bank had the foresite to try and hold the line clear of the boulders that littered the river. After getting out of the boat I walked and tumbled and ran down the river, winding all the time, gaining line back onto the reel, but we felt the fish was lost It took us quite a while to get down the rapids. Eventually we reached the end of the rapids, but I still had not reached the running line. I eventually got the running line onto my reel two thirds of the way down Lower Dream pool, and to our amazement i tightened back into the fish. Another 15 minutes of heavy ponderous runs followed and I found myself praying after all that had happened we would land the fish. When the fish was finally landed the size 4 Guideline tube double was still deeply embedded into the fishes jaw, it would have never come out. 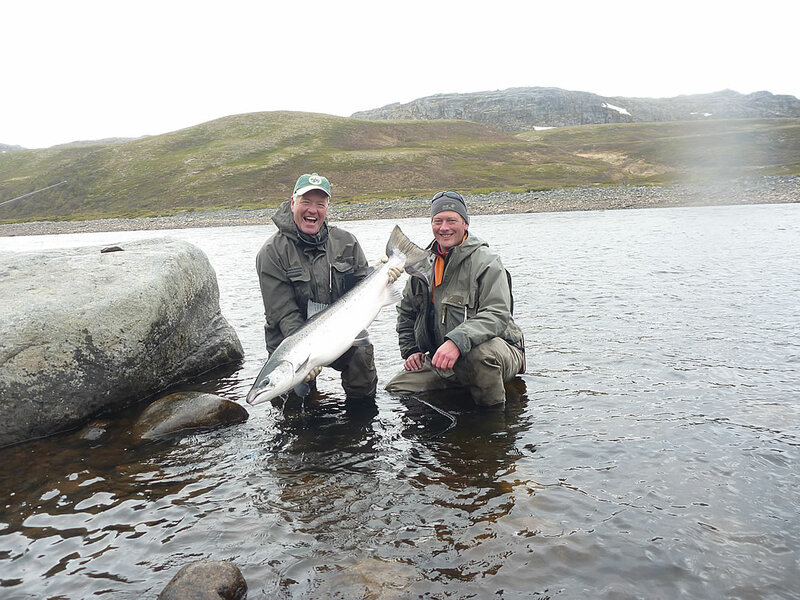 The situation now was one of great elation, this fish was hooked on the right bank of Upper Dream and landed 300 metres below on the left bank of Lower Dream some 50 minutes after being hooked. I now felt I had died and gone to Heaven, a dream come true in a Dream Pool. Vasiliy was just as excited as I was, and we sat down for a coffee still shaking. The rest of the day was a blur, I know I caught another fish from Ledge pool below, but for the rest of the day I was floating. My two biggest fish from these rivers in two days. It doesn’t get better than this. The rest of the week didn’t matter, I was on cloud 9, I fished on and caught more great fish on floating lines and sunray shadows, I even lost another possible 30lb fish in Tent pool where under normal circumstances I would have been pretty upset about such a loss, but the week had been a tremendous success not only for me but for everybody, lots of personnel bests and great stories coming in every day. The team of guys from the UK, Norway, Germany and Japan had bonded very well and we ended our opening week with 93 super fish. BRILLIANT !!!!!!!!! The Happy Team, just before departure. Dave Parkes, Power Team Uk. very nice fish Dave, congrats! sounds like the early season on the Kola was a very good one this year. Cheers! It doesnt happen very often, but sometimes, just now and again things are just right. The best start for a few years. Thanks !! Yes, with salmon you just have to keep at it. Sooner or later (usually later) you will hit the jack pot. Too bad one can’t spend a whole season on the Karlovka! I dream and wish for that !! What a great fish from the rightly named Dream pool. Maybe I’ll get back to the Kharlovka someday. I hope so – but can you make sure the conditions are right. Penry, you know better than anyone that we cannot dictate NATURE !!!!! In more than a few years fishing opening week, although we always get fish, now and again everything comes together, and this year IT HAPPENED !!! Good luck to you and Pat in Iceland. Well done, Dave. Absolute belters of fish!! Only thing is, I see you still have to grasp the concept of metric sizes compared to good old fashioned imperial, ie. the difference between mms & cms. Ha!Ha! 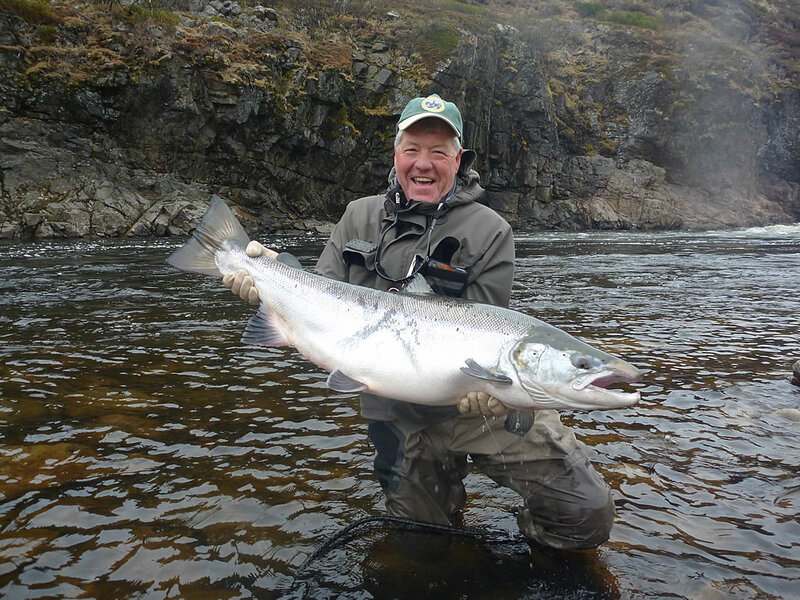 Tose are massive sea lice – I’ve never seen any that big!